Trump’s verbal shrug in Singapore represented a striking change from the way U.S. presidents have viewed their job, a shift from the nation’s asserted stance as the globe’s moral leader in favor of an approach based more on trade-offs with adversaries and allies alike. Trump, who quickly left for the long journey home after his whirlwind summit with Kim, made clear that his main interest — almost his sole interest — was taking a first step toward denuclearizing the Korean Peninsula. There was no lecturing of Kim over how to treat his own people in a nation that is estimated to have between 80,000 and 120,000 political prisoners and remains one of the world’s most closed and oppressive societies. Though Trump is far from the first U.S. president to work with an unsavory counterpart to achieve a strategic goal, his decision to broadcast that he tacitly accepts Kim’s history of atrocities was a sharp break from the position of presidents from both parties to set America as the exemplar shining city on a hill for other nations to emulate. It has been much the same at home. But Trump did draw graphic attention to North Korea’s human rights record in his State of the Union address in January, and championed the plight of U.S. citizens who had been imprisoned in Pyongyang. So he was all but bound to address the issue in some form in his unprecedented meeting with Kim Jong Un. He told reporters that he did raise the cases of Japanese abducted by North Korea in the 1970s and 1980s and the plight of persecuted Christians in North Korea. However, he acknowledged that human rights was a small part of his talks with Kim. And it was not mentioned at all in their joint statement. 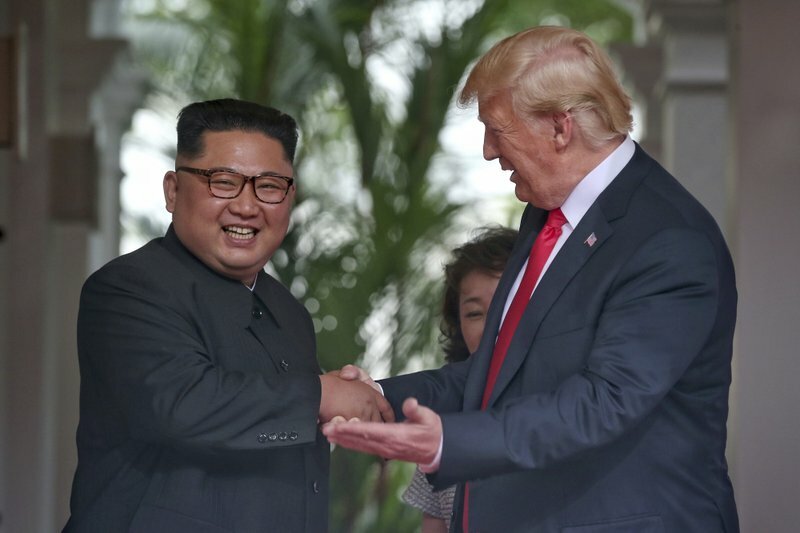 Instead of using the summit spotlight to demand that Kim protect basic liberties, Trump offered a moral equivocation that evoked the kid-gloves approach he has also taken in meetings with other authoritarians for whom he has expressed admiration. Like Rodrigo Duterte of the Philippines, for example, and Xi Jinping of China. And King Salman of Saudi Arabia. The template was established a year ago in Riyadh on Trump’s first international trip. Past administrations have also often skirted human rights in their dealings with Pyongyang, which views the issue as an implicit threat to the legitimacy of its totalitarian regime. But Trump’s relative silence on the issue in Singapore drew some sharp rebukes. Heather Conley, vice president at the Center for Strategic and International Studies, said the impact of Trump’s upbeat meeting with Kim and his effusive description of the potential of the relationship with North Korea — which has often threatened the U.S. with pre-emptive nuclear attack — was all the more jarring as it came days after his bruising encounter with America’s closest Western allies at the G-7 in Canada. She said it would have repercussions for how the United States was viewed around the world. The United States has been in the forefront of an international effort in recent years to highlight North Korean abuses. Washington backed a landmark 2014 U.N. commission of inquiry that found that North Korea’s government had committed crimes against humanity, and Kim Jong Un himself is under U.S. sanctions for alleged involvement in serious human rights abuses. Human Rights Watch said Trump had pushed the issue aside at the summit, and lambasted him for suggesting that the tens of thousands of prisoners in the North Korean gulag were “great winners” because his diplomacy with Kim would lead to change. “North Koreans being brutalized daily in labor camps are not ‘great winners’ today, and they won’t be winners tomorrow — or anytime soon. Nor are the millions of other North Koreans who are routinely subjected to forced labor and deprivations of their basic rights, not just to freedom of speech but to adequate food, housing, education, and health care,” said John Sifton, the rights group’s Asia advocacy director in Washington. But Trump, in an interview with ABC at the summit’s end, defended his cold-eyed pragmatism as part of the hand he was dealt with Kim while on a quest for a greater good. EDITOR’S NOTE: Jonathan Lemire covers the White House for the AP. Matthew Pennington covers U.S.-Asian affairs. Lemire reported from New York.